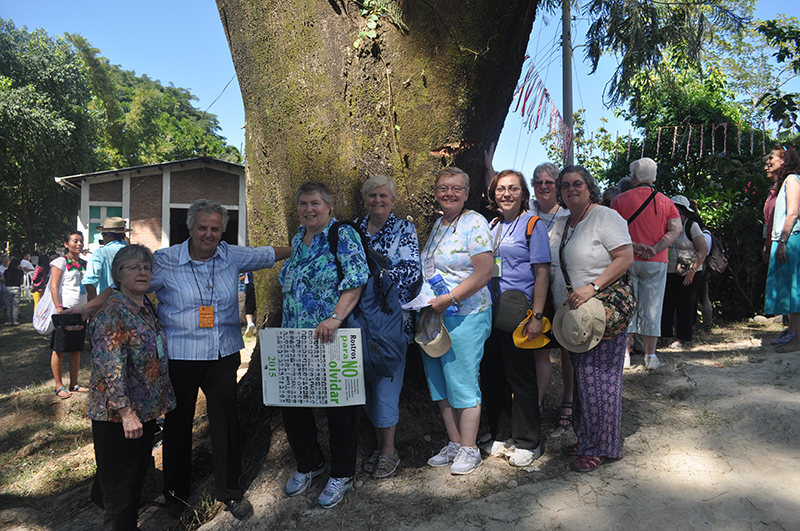 Dominican Sisters participated in the November 28 to December 5, 2015, LCWR/SHARE delegation to El Salvador for the 35th Anniversary of the martyrdom of the four churchwomen. There were 117 delegates. Others in the delegation included: Maura Clark’s sister, nieces, nephew and cousin; a niece of Ita Ford and the daughter of Ambassador Robert White. The experience was profound in many ways. We began with liturgy in the lower level of the National Cathedral where Monseñor Romero is buried. Input from a number of women at different times through the week gave us insight into current reality of El Salvador. At the Monument to Truth and Memory, a wall that holds thousands of names of persons who were killed or disappeared, we met and greeted mothers of some whose names are on the wall, and participated in a press conference with the mothers of the disappeared. A visit to the Jesuit University in El Salvador was a sobering reminder of those whose lives were taken because they worked for justice. Members of the LGTBI community explained their efforts to pass national hate crime and anti-discrimination laws. The Pequeña Comunidad, a base community of women religious, shared their work with poor and persecuted communities. December 2, the anniversary of the assassination, we visited the site where Ita, Maura, Dorothy and Jean were killed, celebrated liturgy at Santa Teresa de Avila with the people of the parish community, and heard testimony from people who knew the sisters. That afternoon we had lunch and learned of the work being done by a confederation of agricultural cooperatives. A meeting with the vice-minister for Salvadorans abroad proclaimed the site of the martyrdom a historical site and all the delegates received a red rose. The next day Salvadoran Legislative Assembly recognized the 35 years of SHARE’S accompaniment of the people of El Salvador. A two hour bus trip took us to Chalatenango for a remembrance at the graves of Sisters Maura Clark, Ita Ford and Carla Piette followed by a liturgy in their memory. From there we went to San Antonio de Los Ranchos, the place where Maura, Carla and Ita worked. After a stop at the site where Carla drowned, we proceeded into the community for a cultural experience, meal and an overnight stay with one of the families. Friday we traveled to another community and met with the women of the Association for the Development of Chalatenango who told of their experience with women organizing, vegetable gardens, and other initiatives that SHARE supports. Upon return to San Salvador it was time for dinner and fiesta, a time to appreciate the experience and all with whom we had spent a powerful week. « Sinsinawa Dominican Sisters to host Epiphany Prayer Service	» Webinar: The Spirituality of the Second Half of Life, by Carla Mae Streeter, O.P.